FileScout updates to v2.7.0.8 - Adds BBM 6.0 integration! FileScout is one of those "why isn't this built in already" utility apps for BlackBerry smartphones. 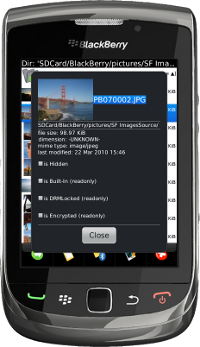 If you haven't heard of it, FileScout is essentially a file browser for your BlackBerry, letting you browse files, copy, move, rename, delete and even zip any files on your device. Now this multi-purpose utility does even more as it has been updated to v2.7.0.8! Check out the change log below. We've been seeing more apps utilizing the new BBM Social Platform, and this is a big one. I'm interested in seeing what other features will be included in FileScout, and what other apps will integrate with BBM next! FileScout is now supporting the new BlackBerry Messenger SDK. With the BBM™ Integration you are able to send any file to any of your BBM Contacts [requires BBM 6.0.0.111 (or higher)]. Please note that even FileScout is already support the sending of multiple files, right now you have to select the recipient and confirm the send process for each of the selected files separate. I hope this can be changed with later releases of RIM's BBM-SDK. Since the release of 2.6.x it was not possible any longer to enter text in Japanese, Chinese or Korean language in the TextEditor. This has been fixed in the new build. Note: If you are using the FileScout Dropbox Plugin you should check that you have the latest Version (v1.2.6.0.6) installed. It's recommend to updated the Plugin first and when asked for the required reboot, say 'later' and then instantly update FileScout as well. When you are prompted then for the reboot, confirm the reboot.